On a crisp but beautiful fall day (the day before I headed to New England! ), I met up with Jenna and Nicholas for their beautiful wedding in Canfield. I was also lucky enough to have the ever amazing Tom Forrest along with me as a second photographer for their magical day. I started off with Jenna and the ladies as they got ready at her parents home (complete with wedding soup!!) and from start to finish it was one of those weddings that left me with a huge grin and a love for what I do. Since I had last seen Jenna and Nicholas they had relocated for work and life had been busy! You wouldn’t know it from seeing them on their wedding day though because they were both so calm and just ready to be married. Their love is one of beaming smiles and warm fuzzies and it was an absolute joy to document it. Many congratulations to the two of you! Thank you so much for trusting me with your wedding day. I started my day with Jenna and the ladies at her parents house and it was so much fun. I especially loved the cute outfit they had their dog in! Jenna smartly decided to not dress until she got to the church. I’ve had a lot of brides lately choose to do this and I think it’s a brilliant move, less chance to get stuff mucked up! 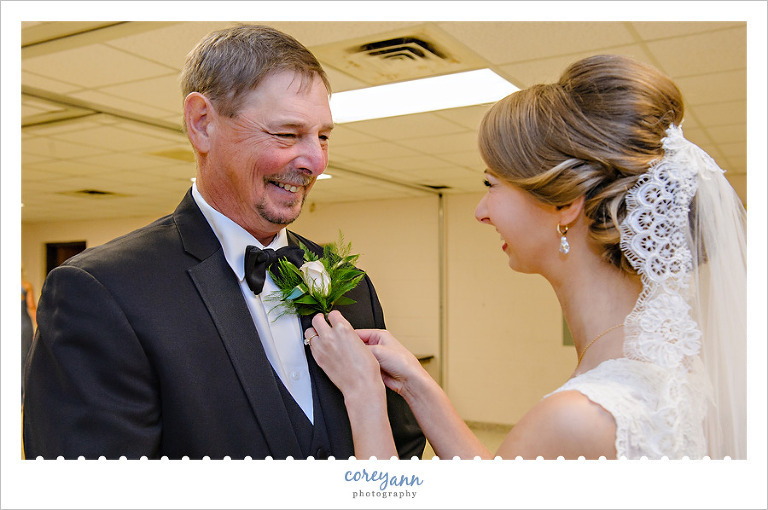 Jenna did a first look with her Dad and then pinned his boutonniere on and he could not stop grinning. It was adorable. 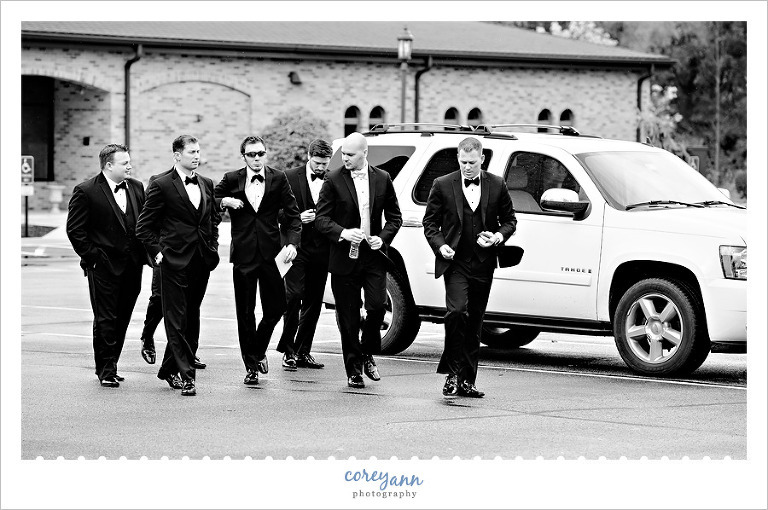 While I was downstairs with the ladies Tom was with the guys and captured this great photo of them when they arrived and were walking into St. Michael’s Church in Canfield. Nicholas had his own first look with his Mom and it was super sweet. I love this portrait that Tom captured of Nicholas. The guys looked pretty amazing! Before the walk down the aisle Jenna’s Dad took a moment to himself. Jenna’s Dad is so proud! It was an absolutely beautiful ceremony! Their smiles say it all during their exit from St Michael’s! After the ceremony we headed over to the ever-popular Fellows Riverside Gardens in Youngstown for their photos. It was perfect, as always. I really loved the gowns that Jenna’s ladies wore! So pretty and an amazing color! How great are these gals and gowns? Also note the bouquets, aren’t they amazing? THE BRIDE’S MOM MADE THE BOUQUETS! How amazing is she? She was the florist for the wedding and did an amazing job. I loved the tuxes these guys wore! Seriously, how gorgeous are these two? I love when my clients aren’t afraid to mix it up and have different numbers on each side. 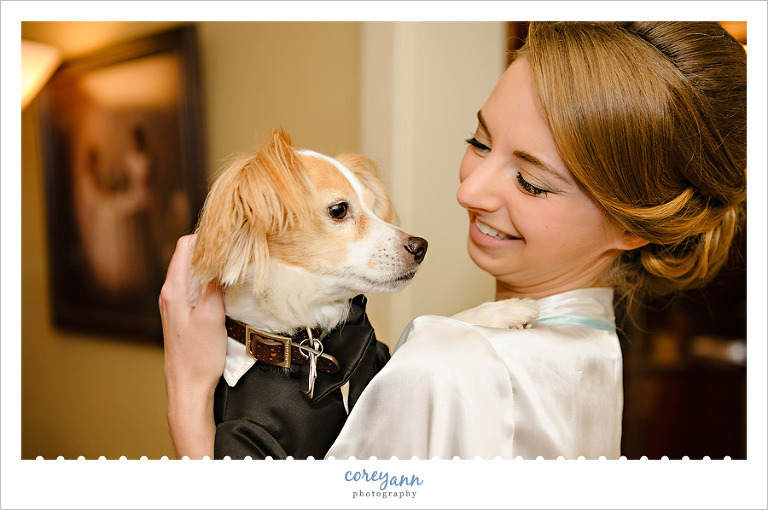 I loved this bridal party! They were a lot of fun! If this photo doesn’t sell you on October weddings in Ohio, I don’t know what will. The giggles are my favorites. How amazing is Jenna’s gown? One last walk around the gardens before we headed down into Mill Stream Metropark! With just Jenna and Nicholas with me as their driver (busses apparently aren’t allowed in the park) we headed down to the Silver/Cinderella Bridge inside Mill Stream Run. It’s such a beautiful bridge and I’m LOVING how it looks with leaves covering it. You can’t go wrong with a dip – and this bridge needed a dramatic dip! These two humored me when I saw the way the light was streaming through the trees in the woods next to the parking lot and begged them to go inside for a few photos. I think it was worth it! I loved the centerpieces at their reception at Mr. Anthony’s! Their sweet, simple and perfect cake from Sugar Showcase was beautiful. Soon it was time for the entrances and I loved that Nicholas did a baby powder entrance like LeBron James. After dinner the dancing started and their first dance was one of my favorites! I love how they kept dipping all day long! Then they continued onto the parent dances with Jenna’s father going first. I may have teared up watching them dance. Once the dance floor opened up the floor was packed all night long thanks to the ever amazing Marino Brothers doing such a great job. You know I couldn’t close out this post without a ring shot… this one you get two because I couldn’t decide between them. Nicholas’s ring is his grandfather’s and I love when rings have sentimental meaning behind them!